This is a really simple arrangement that you can make in a matter of minutes. Start with your succulents of choice and pop their heads off. Hot glue them to little dowels or even wooden skewers. Place those in your container of choice. 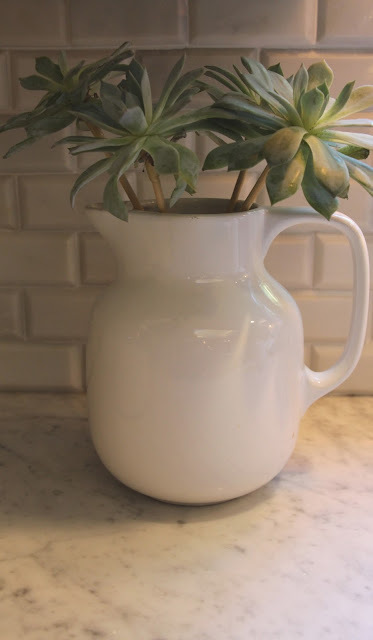 I like using old white pitchers. For this arrangement, I made 4 succulent dowels, which will surprisingly last a long time! Then just start filling in with seeded eucalyptus, lambs ear, and any other greens. You can usually find these packs of "fillers" at your grocery store. 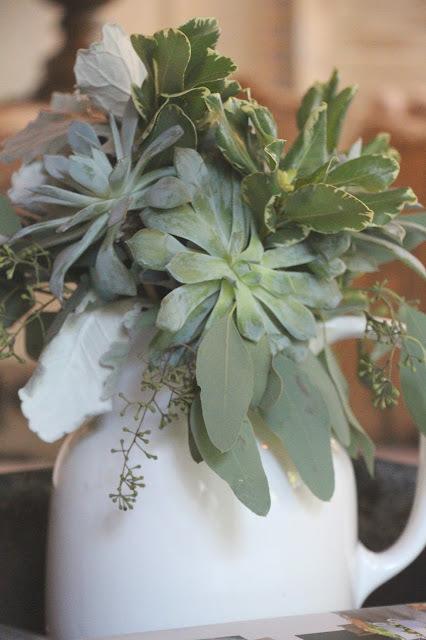 A beautiful neutral fall arrangement that should last for weeks! Really pretty!! So those were live succulents?? Looks great! How beautiful and perfect for fall...love in the white pitcher! That is gorgeous! I know just the place I need to make one of these for! !